Take more free SAT biology subject practice tests available from cracksat.net. 5. The base composition of DNA varies from one species to another. Which of the following ratios would you expect to remain constant in the DNA? 6. Which of the following groups have the most in common with one another? 7. Which of the following individuals is the LEAST fit in evolutionary terms? 8. Most bacteria can be grown in the laboratory on agar plates containing glucose as their only carbon source. Some bacteria require additional substances, such as amino acids, to be added to the growth medium. Such bacteria are termed auxotrophs. These bacteria are denoted by the amino acid they require followed by a "-" in superscript (e.g., arg-). Bacteria that do not require that particular amino acid can be indicated by a "+" in superscript. Different strains of bacteria were grown on several plates containing a variety of nutrients. Figure 1 shows the colonies (numbered) that grew on each plate. The supplements in each plate are indicated. 9. Most bacteria can be grown in the laboratory on agar plates containing glucose as their only carbon source. Some bacteria require additional substances, such as amino acids, to be added to the growth medium. Such bacteria are termed auxotrophs. These bacteria are denoted by the amino acid they require followed by a "-" in superscript (e.g., arg-). Bacteria that do not require that particular amino acid can be indicated by a "+" in superscript. A. Yes, it is able to grow in the presence of the three amino acids being tested. B. Yes, it can only grow if glucose is present. C. No, it is able to grow in the absence of glucose. D. No, it is able to grow in the absence of any additional amino acids. E. The data available are insufficient to determine the answer. 10. Most bacteria can be grown in the laboratory on agar plates containing glucose as their only carbon source. Some bacteria require additional substances, such as amino acids, to be added to the growth medium. Such bacteria are termed auxotrophs. These bacteria are denoted by the amino acid they require followed by a "-" in superscript (e.g., arg-). Bacteria that do not require that particular amino acid can be indicated by a "+" in superscript. 11. Most bacteria can be grown in the laboratory on agar plates containing glucose as their only carbon source. Some bacteria require additional substances, such as amino acids, to be added to the growth medium. Such bacteria are termed auxotrophs. These bacteria are denoted by the amino acid they require followed by a "-" in superscript (e.g., arg-). Bacteria that do not require that particular amino acid can be indicated by a "+" in superscript. A. No, Colony 4 is an arginine auxotroph (arg-). B. No, Colony 4 cannot grow in the presence of leucine. C. Yes, Colony 4's genotype is leu-, pro-. D. Yes, Colony 4 requires only glucose to grow. E. The data available are insufficient to make a prediction. 12. Most bacteria can be grown in the laboratory on agar plates containing glucose as their only carbon source. Some bacteria require additional substances, such as amino acids, to be added to the growth medium. Such bacteria are termed auxotrophs. These bacteria are denoted by the amino acid they require followed by a "-" in superscript (e.g., arg-). Bacteria that do not require that particular amino acid can be indicated by a "+" in superscript. A. The unknown organism is bacterial Colony 2, and these bacteria are eating the bacteria from Colony 1 forming the lawn. B. The unknown organism is a virus that is infecting the bacteria and causing them to lyse (killing them). C. The drop placed in the center of the lawn contained a strong acid that destroyed the bacteria at that spot. D. Bacteria are very delicate and the disturbance caused them to die. E. The unknown organism began producing threonine, which is toxic to Colony 1. 13. In 1910, a small town on the East Coast of the United States relied primarily on agriculture to support its economy. In the mid-1930s, a steel mill was built, and the economy shifted from being agriculturally supported to being industrially supported. The steel mill released a lot of smog and soot into the air, which collected on the bark of trees in a wooded area near the outskirts of town. Over a period of ten years the bark gradually darkened, then maintained a constant dark color. A variety of animals and insects lived in the wooded area. In particular, a certain species of moth served as the primary food source for a population of birds. The moths lay their eggs in the bark of the trees and, thus, must spend a fair amount of time sitting on the tree trunks. 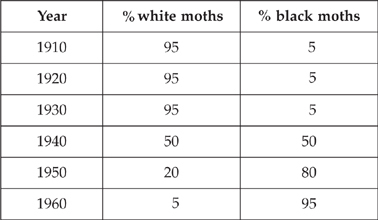 Table 1 presents data on the moth population. 14. In 1910, a small town on the East Coast of the United States relied primarily on agriculture to support its economy. In the mid-1930s, a steel mill was built, and the economy shifted from being agriculturally supported to being industrially supported. The steel mill released a lot of smog and soot into the air, which collected on the bark of trees in a wooded area near the outskirts of town. Over a period of ten years the bark gradually darkened, then maintained a constant dark color. A. The white moths no longer blended with the color of the tree bark and, thus, were selected for. B. The black moths blended better with the color of the tree bark and, thus, were selected for. C. The black moths blended better with the color of the tree bark and, thus, were selected against. D. The white moths blended better with the color of the tree bark and, thus, were selected against. E. The black moths did not blend with the color of the tree bark and, thus, were selected against. 15. In 1910, a small town on the East Coast of the United States relied primarily on agriculture to support its economy. In the mid-1930s, a steel mill was built, and the economy shifted from being agriculturally supported to being industrially supported. The steel mill released a lot of smog and soot into the air, which collected on the bark of trees in a wooded area near the outskirts of town. Over a period of ten years the bark gradually darkened, then maintained a constant dark color. E. The color of the bark is not able to be determined. 16. In 1910, a small town on the East Coast of the United States relied primarily on agriculture to support its economy. In the mid-1930s, a steel mill was built, and the economy shifted from being agriculturally supported to being industrially supported. The steel mill released a lot of smog and soot into the air, which collected on the bark of trees in a wooded area near the outskirts of town. Over a period of ten years the bark gradually darkened, then maintained a constant dark color. 17. Dialysis tubing is a semipermeable membrane. It allows small molecules, such as water, to pass through easily, while larger molecules, such as sucrose, are restricted. Movement of molecules across the tubing is due to concentration gradients. In an experiment designed to study osmosis, several pieces of dialysis tubing were filled with sucrose solutions of varying concentration and placed in beakers containing distilled water. The rate and direction of water movement was determined by weighing the bags before and after placing them in the distilled water. The data are recorded below. 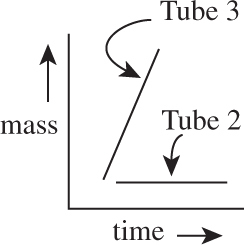 Why does the mass of Tube 3 increase while the mass of Tube 4 decreases? A. 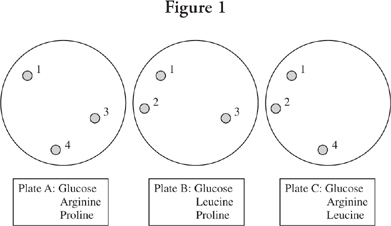 Water is moving into Tube 3, and sucrose is moving into Tube 4. B. Water is moving into Tube 4, and sucrose is moving into Tube 3. C. Water is moving into Tube 3, and water is moving out of Tube 4. D. Sucrose is moving into Tube 3, and sucrose is moving out of Tube 4. 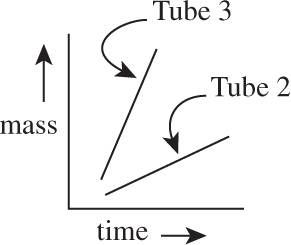 E. Sucrose is moving out of Tube 3, and water is moving out of Tube 4. 18. Dialysis tubing is a semipermeable membrane. It allows small molecules, such as water, to pass through easily, while larger molecules, such as sucrose, are restricted. 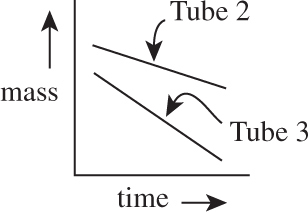 Movement of molecules across the tubing is due to concentration gradients. In an experiment designed to study osmosis, several pieces of dialysis tubing were filled with sucrose solutions of varying concentration and placed in beakers containing distilled water. The rate and direction of water movement was determined by weighing the bags before and after placing them in the distilled water. The data are recorded below. 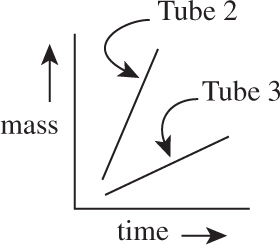 Why does the mass of Tube 1 remain relatively unchanged throughout the experiment? A. The dialysis tubing in Tube 1 is defective and does not allow water to cross. B. There is no concentration gradient to drive the movement of sucrose. C. The dialysis tubing broke, allowing the tube contents to mix with the beaker contents. D. There is no concentration gradient to drive the movement of water. E. The experimenter failed to record the data properly. 19. Dialysis tubing is a semipermeable membrane. It allows small molecules, such as water, to pass through easily, while larger molecules, such as sucrose, are restricted. Movement of molecules across the tubing is due to concentration gradients. In an experiment designed to study osmosis, several pieces of dialysis tubing were filled with sucrose solutions of varying concentration and placed in beakers containing distilled water. The rate and direction of water movement was determined by weighing the bags before and after placing them in the distilled water. The data are recorded below. 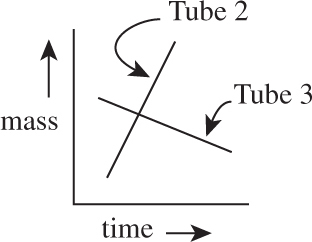 Which of the following graphs best illustrates the relationship between Tube 2 and Tube 3 ? 20. Dialysis tubing is a semipermeable membrane. It allows small molecules, such as water, to pass through easily, while larger molecules, such as sucrose, are restricted. Movement of molecules across the tubing is due to concentration gradients. In an experiment designed to study osmosis, several pieces of dialysis tubing were filled with sucrose solutions of varying concentration and placed in beakers containing distilled water. The rate and direction of water movement was determined by weighing the bags before and after placing them in the distilled water. The data are recorded below. Cell membranes are also semipermeable, allowing water but not other substances to cross easily. A red blood cell placed in a 0.9% NaCl solution will neither swell nor shrivel. 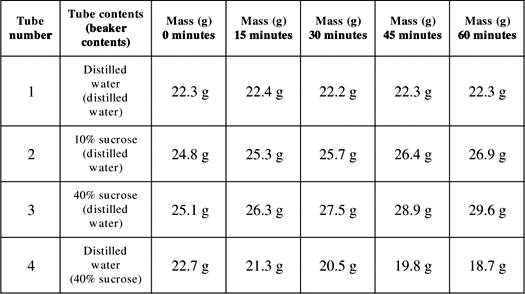 Based on this knowledge, and the information presented in Table 1, what would happen to a red blood cell placed in a 20% NaCl solution? A. Water would be drawn out of the cell and the cell would swell. B. Water would be drawn into the cell and the cell would swell. C. Water would be drawn out of the cell and the cell would shrivel. D. Water would be drawn into the cell and the cell would shrivel. E. No change would occur to the cell. * SAT is a registered trademark of the College Board, which was not involved in the production of, and does not endorse, this product.